The Colonial [EPC01] - $699.00 : Gas Light Conversion to LED!, Looks like a Gas Light! 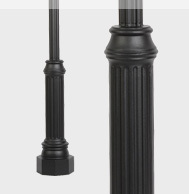 Our Colonial lamp post offers extreme flexibility for bolt down applications with multiple outside diameter sizes in both smooth and fluted styles. It can be paired with any of our gas or electric lamps. Cast Aluminum Ladder Rest options are available - please see "Ladder Rests"